This bracelet is made on expandable wire to allow for a comfortable fit. It has a blend of light and dark peach faceted jade and czech glass beads, as well as Swarovski crystals. It has a silver-plated lobster clasp. This peach and cream choker is made on expandable wire and is accented with dancing freshwater ..
Update your wardrobe with this expandable peach choker that features a drop mother-of-pearl pendant ..
Feel special in these peach and salmon hoop earrings. They hang on silver-plated leverbacks an.. This expandable choker is great way to add a subtle touch of style to your look. It is very d.. These peach earrings feature coin-shaped mother-of-pearl beads, faceted jade and Swarovski crystal.. This peach and ivory choker that is made on expandable wire. It has a coin-shaped mother-of pe.. 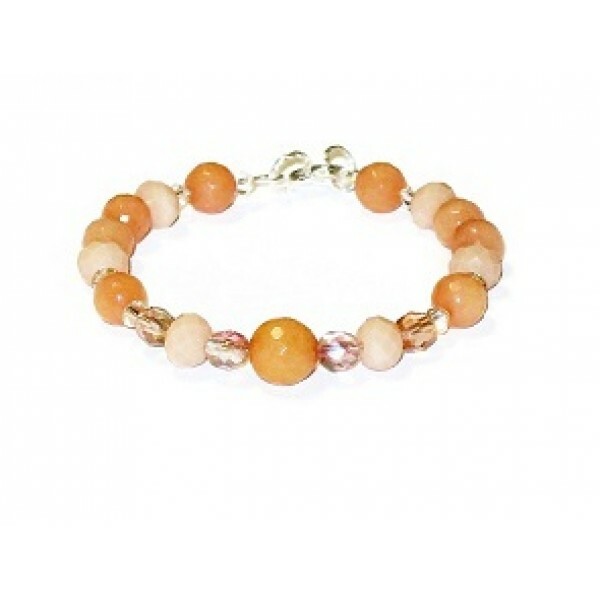 This expandable choker contains a blend of peach, salmon, off-white and peachy beige-colored beads.&.. Dress up your hand with this salmon faceted jade ring, which is wrapped with non-tarnish silver-pl..